I hope that you have had a good and very productive week. I have got loads done despite being really busy again at work. This week has gone very quickly due I suspect to it being 4 days rather than 5 – wouldn’t it be lovely if every week could have a day off – rather than a Bank Holiday we could all have a Hobby Holiday every week. I’m sure it would make sense economically as production would remain the same – even be higher as people would be more relaxed, happier (especially if you read all those studies about craft activities lowering the blood pressure and releasing endorphins). All we need is a political party that believes in that kind of policy and problem solved – we wouldn’t have had a hung parliament! Anyway I digress. I have decided that in the same way that I love doing small items of stitching I also love doing small items of knitting. I really enjoyed the teddy and all her outfits and am going really well on the baby cardi I started last weekend. So much so that I have bought some more Sublime wool (this time in the gorgeous turquoise colour) to knit another cardi for the other baby in the family. 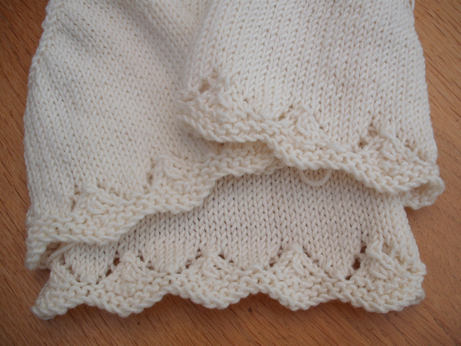 It is a great pattern and knits up really quickly and the Sublime wool is very lovely to knit with – it is very soft and silky. The stitching has been coming along very well and I have finished the ornie for my Spring exchange – can’t show you pics yet but I am very pleased with the end result. It would have been winging its way to the USA as we speak had I not inadvertently deleted the e-mail with my exchange partner’s address in (doh) so am waiting for her to mail that to me again. I have finished the stitching for my scissor keep for Tracy from Cupcakes at Home’s raffle to raise money for her rare breed sheep. Please go and visit her site if you haven’t yet and do buy some tickets. All I need to do now is sew it together and add the braid. After the cardi is finished I need to cast on for some Forget me Knot flowers. Our knitting group are making some to give away in exchange for donations at our Knit in Public event day in June. 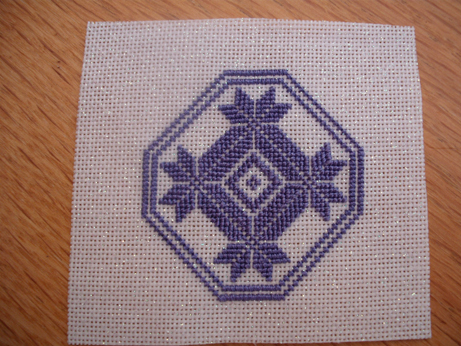 Stitching wise I have a WIP with my JWB designs cockerel to finish (only done a tiny bit on this start) then I think I had better get cracking on some Xmas ornies – it is May after all and as I have about 12 to do it really is about time. 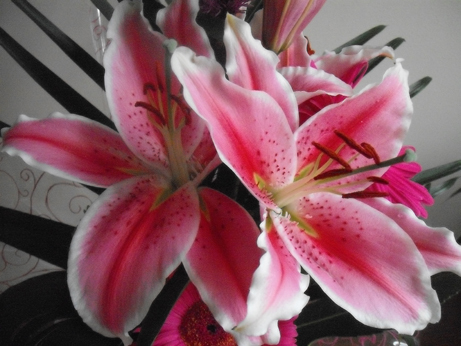 Will leave you with a further pic of the lovely flowers that my students bought me last week as the lilies have come into flower. They are so lovely – it always amazes me that this perfection and wonderful use of colour comes from Nature every one just as perfect as the other with no intervention. I love lilies and have loads in my garden just coming through. The clematis is nearly in flower as well and looks to be fab this year so will post some pics of that soon. Bye for now – thanks for visiting. looks like you have been busy! Love the quaker motif. Hi Alison, love the baby knitting you’ve done and the quaker motif – you had a good Jamie Party last night Judy tells me – shame I couldn’t be there but as you know Peter and I are in sunny warm north Norfolk!